HS - no HobNobs but as I ordered myself two hot chocolates (2-for-1 offer) I ended up with 2 small shortbread-type biscuits as they left one on each saucer. Hope you get your laptop problems sorted - although I see the RW forums are having a 'wobble' anyway which won't be helping. RF - my small Fuji is the 'point and shoot' variety. My digital SLR has all sorts of programmes I could (should!) use so I have to try and use it properly instead of just selecting 'program auto' mode whenever I take it anywhere. I liked the "wondering what to do for the rest of the day" comment - being retired I sometimes have that 'problem' but not that often. Glo2 - I don't know what or who April the Giraffe is and I'm resisting searching on Google to find out! HS (again) - I decided I couldn't be bothered with sitting through hours of coverage of the indoor athletics (well, certainly not at this stage of proceedings). I'll probably record the last days coverage on Saturday so that I can fast-forward through the interminable what might happen/what just happened discussions and just watch the actual athletics!! I've been wading through yet more pensions paperwork today. The latest one told me to answer all questions on the 'retirement information form' but there were three different forms all with that name and the instructions on them contradicted themselves. I spoke to someone who talked me through what information to put where on each form and said they would get someone to look at the forms and rename some of them to make it less confusing. Hi everyone, it's good to see so many posts on here now as a week or so ago it looked as if poor HS was single handedly keeping this forum going. I managed to fit in a short run yesterday, it was quite taxing as this part of Durham is rather hilly. Actually I'm quite glad that it's hilly as I think it will eventually provide better quality training - when I lived at the coast most of my runs were on the flat or slight inclines. It is taking a bit of getting used to though! Runningfox - I must say I'm quite envious of your pre-dawn run up Castle Hill, when I was working I used to go out about 6am for my run and often saw the sun rise over the sea. Its lovely being out at that time, everything's quiet and there's hardly anyone else about. It's a special time of day. MWW - I like the sound of your Darth Manion race - what distance is it? glo2 - like Runningfox I don't do much in the way of stretching or taking on board food or drink before my runs, and I also warm up with a 100m walk at the start of my run. But I do make sure I rehydrate after the run and have some protein and carbs shortly after arriving home. If I'm running in the morning I have porridge and fruit when I get back, that's my favourite post run meal. It's bright and sunny and a rest day. Tomorrow is forecast heavy rain, so not ideal conditions for the race. Having said that, it might be to my advantage, as much of my training has been in heavy muddy conditions. WtnMel, why do you have 3 stars after your name? My laptop is ok now thanks, although I wasn't aware of any wobbles on the forums. Good luck with your pension paperwork, I think it is deliberately made complicated so we won't bother with it. There is talk now of making Terms and Conditions simpler, so we don't skim over them without reading. An example in big letters is "3 months free trial" whilst in very small letters you are committed to a yearly subscription unless you opt out. Aquarius, yes it's really good to see that numbers are back up again on this thread. I was feeling rather lonely! You are correct in saying that hill running is better quality. It will build up your strength and endurance. I'll let you know tomorrow how the race went. I'm thinking it might be a bit of a mud fest, so times will be slower than usual. I've just noticed, I've got 3 stars now. Misty morning, but it has cleared a bit now. I should have been doing a XC at Alnwick today, but didn't feel fit enough at the moment for a hilly muddy XC course so opted instead for the Gibside parkrun - and guess what, it turned out to be a hilly muddy parkrun! At least it wasn't as competitive as the XC would have been, so I didn't feel too bad about walking a few steps on some of the hills. I haven't done this one for a while and had forgotten how hilly it is. There's a total elevation gain of 335ft, which consists of steep uphill sections, with some short downhill bits, for over 2 miles, then a steepish downhill for about half a mile, with a short flat section at the end. It's quite a rough, stoney path so it's difficult to get speed up even on the flat section, even if your legs would obey you. It probably sounds awful the way I've described it, but in a funny sort of way it was enjoyable. I'll certainly try to fit it in on a regular basis if I can because it must be good for legs, heart and lungs. Good luck anyone running this weekend (HS in particular). Have finally got my head around the new thread, having found the Over 60s one a few days ago. Although I'm an occasional visitor myself it's good to see some new names as well as some more familiar ones. I was out of action with a bug (which was very stubborn) at the time the threads were transitioned but for the last few weeks have been back in training and improved gradually from the nadir of early February Thus I managed a parkrun today in 21.34 which was my best for 2017. I am very much a fair weather runner (I feel the derision of hard-core trainers! )which means that I love the feeling of sun on my back - and this was the case today. Lots of interesting events around for those who want them but for me I am just trying to get back to a sub 21 5K. Happy running to all! Glad you found us JB6, good that your bug has finally gone. Congratulations on your fastest parkrun this year! Raining steadily, so todays race which is in the forest, will inevitably be very muddy with lots of puddles and streams. A real challenge I believe. Aquarius, that was very hilly for a parkrun, so must have been tough. I'll award you 3 stars. JB, glad you found your way onto the new forum, and that you have shifted that bug. Well done for your 21.34 parkrun, must be a high WAVA. It's raining harder now and come over very dark, doesn't bode well for later. Thanks for the nice comments. (The WAVA was 75.66%.) Weather here is a bit grim but I belied my 'fair weather runner' status by running 10 windy miles along the prom. This was largely to keep my training partner company - he was running 17 in preparation for the Brighton marathon in April. However, it is still a lot easier than slogging up hill and down dale on a XC course - so well done to Aquarius for yesterday's effort and good luck to HS for today's. Posting from my 'other' computer today (my old desktop which I use to store my iTunes music and my photos) while my laptop is busy doing a backup and updating our sat-nav. You wouldn't believe how confusing it is having the two keyboards and mice on the desk in front of me - I keep trying to use the wrong one! Aquarius - I've visited Durham and remember how hilly it was. I have to make myself run up the steep (1 in 4) hills near me as it's good training. Glad my rant made you feel better too I hovered my mouse over the stars HS and I have .. it's because we're 'Level 3' (whatever that is). I would award you 3 stars if I only knew how. HS - pensions paperwork is a necessary evil I'm having to wade through but at least I have my IFA to help me with the decision-making. JB - glad you've found us and re-joined the thread. Glad to hear you shifted that bug (sounded nasty). I've never tried a parkrun but in a 5k race I did a few years back I was happy to get round in approx. 28 mins so you're doing well with your 2017 PB. I've not been out for a run over the weekend but I'll be heading out in the morning. My car has it's MOT test tomorrow so wish me luck (only 7 years old so should be okay but you never know). I used to rely on notifications that "someone" had left a "reply" to my comment on one of the RW threads, to remind me to have a look; but I'm not getting them now so I keep forgetting to check. Thank you, those who asked, - car is now fine, needed a new battery, bank balance now a little lighter. Wondered what WtnMel meant about the rubbish colour scheme; doesn't seem to be a colour scheme at all to me, just blue-and-white. Oh, perhaps that is what he means! TE - there's a ticked box "allowing others to see my email address"? - horrors, I must find it and make sure it's unticked. Still making slow but steady progress, 3:1 run:walk. 42 minutes on Thursday, 45 minutes today. Now covering parkrun distance and more. Incidentally, I think parkruns give age category results up to goodness knows when; I know they're not "races", and don't give prizes or medals, but still there's some satisfaction in finding one is First in Age Group (even though that is usually because one - or I, at least - is the only one in the age group). MWW - I shall be at the VLM, cheering-on Youngest Son, who (rather to his own horror) got a place. He's been training conscientiously, so should be ok. I could look out for you if you could let me know what you look like, what you'll be wearing, and roughly how long you expect to take. Anyone able to read me? Fingers still crossed. Morning everyone, it is so nice hearing about everybody's efforts, well done to you all. Aquarius I don't really understand the elevation too much only incline but it sounds awful, i have noticed it on my treadmill preselected runs, however i would not know how to work it out on outside hills? i use my fitbit watch, so perhaps i need to look into it i also use an app on my phone but i don't really look on the statson that app as i now use fitbit stats, the only reason i use the other app is for the constant update on my milage times. HS hope you race was a good one yesterday and you are enjoying your rest and recovery. I purchased a few nutrition books, one by Matt Fitzgerald titled "The new rules of Marathon & Half Marathon Training" it seems quite good so far, and i am putting into practice some things already, so i decided on Saturday not to use a VMX one shot which i bought in bulk from Costco, i decided i need to do things properly. so i will return the pack of 12 upon my next visit. i ran my long run Saturday 13 miles and this morning it was 7 miles, a mile less than previous weeks, and for a change i felt good. I have not checked my times from today but I know it was better than last weeks. Hope you all have a good week, Happy Monday to you all. Columba - yes, the lack of a colour scheme (well, white with blue bits) and the fact you can't change to different colours were what irritated me. I looked at your profile but couldn't see your email address so I 'think' you are safe. Glad you're continuing to build up your distance. glo2 - I don't ever work out the elevation changes of my runs .. I log them all on Fetcheveryone and Strava and they do all that for me. Well done re Sat's LSR and this morning's 7 miler. I went out this morning and did a 5 mile route around town (squishing Fetchpoint bugs as per usual). Yet again I ran along roads I've never visited since we moved to Bishops Cleeve. I got back at 11am and had to do a quick-ish turnaround as I had to drop my car off at the garage at 12pm for it's MOT test. Edited (13:45): Just got back from collecting my car and remembered something I meant to add earlier. I settled down yesterday evening to watch the indoor athletics - unfortunately there was some kind of 'blip' at the start of the transmission. My recorder got the signal to start recording but after 8 minutes got a signal to tell it to stop so there was nothing to see apart from some sort of 'test card'. At least the World Series Triathlon had recorded okay earlier in the day so I was able to watch that instead. 4 miles this morning. Still windy in these parts. WtnMel - well done on the MOT - always a big relief. I don't know if anyone watched Country File last night. There was a brief feature on the South Downs Way ultra (100 miles). The current record is run at the equivalent of 8.5 minute miles. The presenter tried one mile at this pace and looked shattered! Quite a few posts since my last one! JB, well done for your windy 10 miles and 4 this morning. I did watch the Country File programme, as I used to run on the South Downs when I lived in Waterlooville. Columba, I never got notifications from the old forum, although the box had been ticked for years. I'm getting them now, so that's an improvement. I got one yesterday from DBIW saying she had posted on this thread, but it hasn't appeared. glo2, well done for your 13 and 7 miles runs. Sounds like your fitness is improving. WtnMel, good news that your car passed its MoT. My race went well yesterday despite the horrendous weather, especially the last mile or so, when the wind got up and we were battered by very heavy hail stones! Never felt so cold in a race!. I was pleased with my 1.51.13 in such adverse conditions. There was no MV70 category, but I came third MV60, so can't really complain. Taking a rest day today to recover, but have done some core exercises. HS - great result. I love it when I (very rarely) do well in a lower age category. Bright and sunny but quite cold. I'm not going to club this evening, as it is 45 second hill reps, and I ran more than enough hills on Sunday. I will be going for a leisurely forest run later this morning. TE: Similar weather up here this morning. Clear sky to the east so treated to a gorgeous sunrise on my dawn run. Excellent result in Sunday's race HS, but the weather conditions sounded awful, which made your "3rd MV60" placing all the more impressive. Hope your forest run today wasn't as cold. Similar cold weather here in the northeast too. I had another hilly, but short, run yesterday. I think I noticed a slight improvement in my energy levels, just pleasantly tired afterwards rather than utterly exhausted. If I can find a flattish route I'd like to do a slightly longer distance tomorrow. Thanks Aquarius, it was a very tough race, battling the elements as well as the terrain. I had a rest day yesterday and felt better than expected this morning. Reference your hilly run, it's always good to feel pleasantly tired, it means you have put in about the right amount of effort. DBIW has been trying for ages to get back on here, even getting a new computer, but for some reason, her posts fail to materialise on this thread. Conditions were good this morning and I ran a leisurely 7.6 miles, with occasional bursts of speed. Sad news the death of Mike Smith who was Coach to greats like Chris Akubussi and Roger Black. He was coaching Team Solent whilst I was a member. I'm not sure if this will work on the new RW but I will attempt to upload a photo I took this morning. Aquarius, lovely to see an improvement in energy levels, especially on the hills! I thought I had posted yesterday but didn't show on the thread? I have been keeping the milage up, did 21 miles on Saturday, then a hill session Monday and 10 mile tempo before work this morning. Plan is to do Llanelli Half on Sunday so a bit of a cut back week. Very diverse weather in Swansea, cold, warm, rain, hail, sun, wind! JB6 - that's very strange re the red-lined text on the Over-60's thread .. I can't think why it would do that. I gave up watching Countryfile some years ago - I got fed up with the way they filleted up the various stories and filled the show with "in a bit we'll be telling you about this" & "earlier on we told you about that" and assumed you had the attention span of a gnat. It drove me nuts so I gave up on it. As Mrs Wm and I are hoping to walk some of the SDW later this year, we might have been interested if only for the scenery and terrain. HS - I'm pleased you were pleased to see a few more posts than you had been getting used to I wish there was some way to contact DBIW - I can't think what is causing her problems but am sure two heads must be better than one. I still wonder if she needs to clear her temporary internet files and whether a link on her computer is pointing to the wrong website address. Well done re your race result. MWW - I see you are also having problems with missing posts - very strange. Well done re the 21 mile run, hill session and 10ml tempo run in quick succession - very impressive stuff compared to my 4,5 & 6ml runs. I ran 4mls this morning then had to do a quick turnaround as I needed to drive over to see my son (1 hr) then take him to hospital for an eye-check (1 hr). Then after a 30 min wait I did the reverse journey. Needless to say, since I got back I've not done a lot! Bright and sunny and going for a 10 mile forest run with Jane later this morning. MWW, thanks, I was pleased with the result. Well done for your 21 mile run, hill and tempo runs, and best of luck with your half marathon. I'm sure you will do very well. WtnMel, hope the new hearing aids are an improvement. 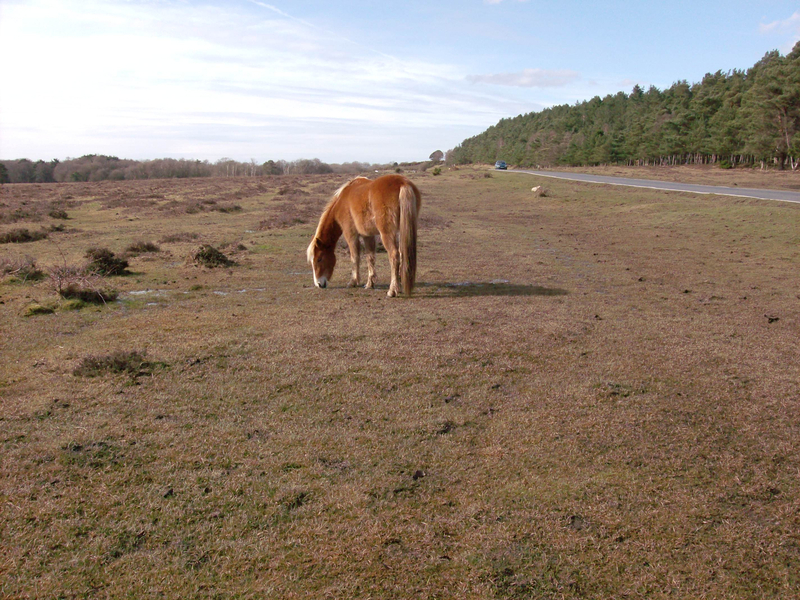 I was just wondering whether anyone liked the photo of the New Forest pony as nobody commented on it. HS, apologies, I did see your photo and was very impressed by it. It reminded me of our visit to the New Forest last year. You are very lucky to be able to live (and run) there. Enjoy your run this morning (and keep the photos coming). WtnMel - many thanks for the stars, and as soon as I get the other seven I'll send you a penny....How are you managing with your hearing aids, are they easy to get used to? I'm hoping to get over to the coast this evening for a training session with my club, this will be my first time since moving over here so I'm not sure how it will work out. I intend to try to get there once a fortnight but will have to see whether it's feasible as it's a 40/45 min drive each way. We actually ran 12 miles this morning, as it was so bright and sunny, and good not to have to wear two layers. I very nearly lost my right trail shoe in the mud, but luckily, my toes were still in it, and I was able to get it back on. A much needed rest day today. Managed to get to the club last night, and to my surprise I persuaded Steve to come along and join in the session too (he's always refused in the past). It was a bit of a rush though, I knew last night's training was taking place near a leisure centre, so we decided to park outside, then we could get nip in and get a shower before driving home. By the time we found a parking space we only had 7 mins to run a mile to the club to catch everyone before they left for the session. Needless to say as we staggered breathless into the clubhouse we were informed we'd just missed the others, so we set off again and ended up finding them a few yards from where we'd parked. Apart from that hectic beginning it was an easy "long out and backs" session (6 minutes "out" at a comfortable pace, then "back" at a faster pace, nothing specific just faster than the "out". This was repeated at 5 minutes out and back, then 4 minutes. It was a good introduction for Steve (rather than a tough track session) and he seemed to enjoy it. However by the time we'd had our showers and driven home it was almost 10 o clock and rather late to be eating. I'm not sure whether we'll be able to make this a regular trip unfortunately. Well done HS for hanging on to your trail shoe! That must have been a muddy 12 miles. I hope you enjoyed your well earned rest day today. Looking forward to your next photo, it would be nice if we could all upload a photo of where we run, it would be interesting to see everyone's "home patch". It's foggy again, but I'm not running this weekend as I'm visiting my daughter. The rest days from running will probably be beneficial, as I have been racking up the miles a bit. Aquarius, a rather hectic session for you! Out and back sessions are good training. This is similar to one I used to do in the week before a race, which was for exactly 9 minutes, and comprised 50 metres flat out, return at good pace etc until 9 minutes was up. A lot tougher than it sounds.